Technology: constant quality control, continuous machinery production line. Polycarbonate Sheets are made up of polycarbonate polymer which is durable, high impact-resistant, low scratch-resistant and heat-resistant. With good insulation properties and excellent UV protection. These Sheets are ideal choices for natural light transmitting for Roof glazing, Skylights, Pathways, Bus shelters, Shopping Arcades, Canopies, Partitions, Greenhouses, Industrial glazing etc. Color Available: Blue, White, Green, Sky Blue etc. 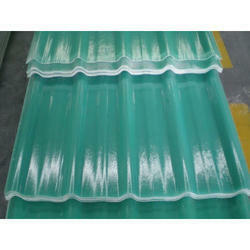 We are offering FRP Sheet to our clients. Gupta Iron & Steel Co.